Holly West: Many things have the power to transport us to other times and places. Scent, for example. One whiff of Polo by Ralph Lauren and I’m walking through my high school’s corridors, keeping an eye out for my latest crush (thankfully, Polo isn’t on trend these days so those whiffs are few and far between). Books and movies, too. The mere mention of Judy Blume or Laura Ingalls Wilder takes me back to my childhood bedroom, where I spent untold hours reading and re-reading books. And films like “Bob Roberts,” “Pulp Fiction,” and “The Crying Game” remind me of my twenties, when I was single and broke and spent every weekend in the bargain matinee at the Beverly Connection in Los Angeles. But music, I’ve found, is the ultimate time machine. I’ve already dated myself, so I don’t mind telling you that I recently turned fifty. As part of the celebrations, I compiled a playlist of songs representing all of the seasons of my life. It was a long list, spanning not only the decades I’ve lived through myself but those of my grandparents and parents since their musical preferences comprised much of the soundtrack of my earliest years. I can’t listen to Johnny Cash, Patsy Cline, Loretta Lynn, or Hank Williams without thinking of my grandparents—they instilled in me an abiding love for twangy country music, as did my mother for the cheerful Broadway musicals of the 60s. My brother, who works in marketing and PR, told me that supermarkets play 80s music now because that’s the generation—my generation—that’s doing the shopping. And he’s right. I can’t go into Ralph’s without hearing Madonna, Duran Duran, the Go-Go’s or The Cure. There I am, standing in the checkout line, when Whitney Houston comes on the sound system singing “How Will I Know,” reminding me of my senior prom date, who, years later, came out to me at a Mexican restaurant in our hometown. Not so long ago, supermarkets were playing Fleetwood Mac, Jackson Browne, and the Eagles—songs I knew, but were firmly classified as “before my time.” I suppose Rihanna, Lady Gaga, and Pitbull will sing the next wave of supermarket hits. Even, perhaps, cleaned up radio re-mixes by Post Malone or Cardi-B. That’s when I’ll know I’m really old. On a side note, one of the best things about living in the digital age is having all the music we want at our fingertips. Kids today will never know the exhilaration—and sometimes, the heartbreak—of having a cassette recorder at the ready, waiting for a song to come on the radio and pressing record at just the right moment. In those days, every recording had Casey Kasem’s voice floating over the song’s opening bars (if you were quick enough to catch those opening bars at all). Much like books, the music we embrace in our youth becomes an integral part of who we are. I keep semi-current with today’s music and enjoy much of it, but none of it will touch me the way that early music did. I’m no expert in these matters, but it seems that as we get older, we lose our tendency to internalize external things like music. We’re able to enjoy and appreciate it, but it doesn’t have the same impact. We’re older now, and mostly, wiser, with our hearts steeled against every sentimental love song. Okay, so Lady Gaga’s and Bradley Cooper’s live performance of “Shallow” at the Grammy Awards touched me, but that’s something else entirely. Or maybe, it’s not. Maybe I’m not the hardened old lady I think I am after all. What about you, Reds and Readers, what music transports you? Holly West is the Anthony Award-nominated author of the Mistress of Fortune historical mystery series. 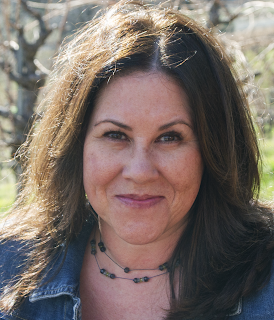 Her debut, Mistress of Fortune, was nominated for the Left Coast Crime Rosebud Award for Best First Novel. Her short fiction has appeared online and in numerous anthologies, and her latest story, “The Best Laid Plans,” appears in Florida Happens, the 2018 Bouchercon anthology. 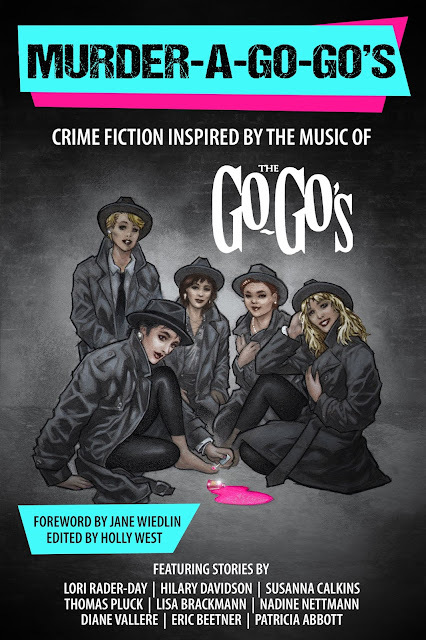 She’s also the editor of Murder-A-Go-Go’s, a crime fiction anthology inspired by the music of the Go-Go’s. Visit hollywest.com for more info. Crime fiction inspired by music . . . I’m looking forward to reading that! I suspect I will always be a Johnny Cash fan just as I really enjoy pop and jazz, Julie London style . . . .
As luck would have it, there's an anthology inspired by Johnny Cash's music, edited by Joe Clifford, called JUST TO WATCH THEM DIE. You might want to check it out! My own Johnny Cash story is that my grandparents used to bowl with Johnny's first wife when they lived in Ventura, CA. Johnny would come pick her up sometimes.. The music I mention won't mean much to you, I'm sure, since I grew up listening to Christian music. But there is one song that immediately makes my entire family want to go to a redwood campground where we spent many happy days over the years camping while I was growing up. (And now I want to go there.) Other music takes me to the summer I was working a water slide park. I mean, I'm on the road driving there as I listen. It truly is amazing how certain songs can do that, isn't it? Agnus Dei - Michael W. Smith - will drop me to my knees every time!!! Trying to remember who. A friend mentioned Amy Grant. Is she a Christian singer? Mark, I grew up in a religious household (Catholic) so the old hymns we used to sing always take me back. Lyda, I enjoy Agnus Dei as well. Bibliophile, Amy Grant started out as a Christian singer. She is more adult pop than a Christian singer these days. Holly, I'm finding ways to get recordings of those old hymns these days myself. I'm really enjoying listening to them again. Bibliophile, I should point out that I have the complete Amy Grant collection, and certain of her songs definitely take me back. Even the ones that scream 70's or 80's (you know, when they were originally recorded). Music has always been a huge part of my life, but my musical tastes have come in phases. As a kid, my dad decreed that we would only listen to the heavy classics, like Beethoven, Wagner, and Tchaikovsky. Once I got control of what I listened to, I was able to sneak in some 70's pop, plus all the tunes from the musicals we steeped ourselves in at the theatre department in college. Then I married a guy with broad musical taste, who brought me up to speed on the Beatles, the Stones, Dylan, 1960's pop, Hank Williams, and the singer/songwriter scene down in Austin. I fell hard for Guy Clark and the Flatlanders. When Warren died, I found I couldn't listen to the songs we enjoyed together without breaking down, so I built myself a new soundtrack of music we didn't share, including Mark Knopfler and Sonny Landreth. Now, of course, I've cycled back to classical, immersing myself in emerging American composers like Adam Schoenberg, Frank Ticheli, David Maslanka, and John Mackey--several of whom I've schlepped around Dallas while my band rehearsed their latest works. I've told my family that, if I'm ever lying comatose in the hospital, they should just play the Dallas Winds' recording of music by John Williams. If I don't respond to that, unplug me, because I'm gone. Yes! Will include this in my "Final Wishes" Packet. Music has been a huge part of my life too, even during the years when I could not hear music at all. I remember my cousin was learning how to play the cello and she wrote me a letter saying that she hoped that her playing would not give me an headache. I used to get headaches listening to music and now we know it was not the music. Because I had bone ossification inside the cochlea, the hearing aids gave me headaches all the time! Loved the opera because of the English subtitles. My boyfriend introduced me to Mozart. I loved Beethoven the first month after I started to hear wth my cochlear implants. To me, the music sounded gentle to my ears. Thank you for the list of many composers who are new to me names. I love the idea of making a memorial playlist (for my own!) When a dear friend died suddenly a couple of years ago, we played Billy Idol's White Wedding because it was one of her all-time favorites. There wasn't a dry eye in the house. The contemporary composers I mentioned mostly write for wind ensemble, which is all the good stuff of classical music, without the screechy violins. If you prefer gentle music, try Frank Ticheli's "Rest" and John Mackey's "Sheltering Sky." Naturally I'll recommend the Dallas Winds' recordings of these works, since that's my band. I have become more aware of how hearing-impaired people can enjoy music as we've welcomed students to our concerts and watched them experience the music as vibrations they feel in the balloons they hold in their hands. I'm so glad that music is bringing joy to your life! Hi Holly! It was great to meet you at LCC. I’m awake because of jet lag. I arrived home yesterday from Canada. Music has been a big part of my life. Before losing my hearing, I used to sing along with the songs on Sesame Street. Growing up with music meant going to see a relative play professional music. She started a women’s bluegrass band. Now her daughter is a professional singer. After I got my cochlear implants, I noticed that I like certain music types better than other types of music. Congratulations on your new book! And I look forward to reading your book. Lucy, what was it like living in East Tennessee? The bluegrass band was called Good Ol' Persons. Now the new band is called the Kathy Kallick Band. Yes, the band has a website. And another relative has a band called The Gold Band (?) . Yes, my musical tastes changed as my hearing did. It was great to meet you, too. What a great conference that was. Except I came back with conference crud so I'm a little under the weather. Thankfully, no jet lag though. I will check out your relative's band. I love blue grass. Hello! I have jet lag too, which is why I was up at 2 a.m. this morning writing a comment. Thank you for checking out my relative's band. My first music memories are of the post war big bands, listening along with my Aunt Dot. This is good stuff, so rarely heard these days. I was a teenager in the 50s, and what a decade that was, AKA intro to rock 'n roll. I can attach almost any of those tunes to some night in Beano's, necking with the current love in the back booth. Then came the 60s, and what can I say? I've not been that immersed in pop music since. However, thru all this, my real love is what my mother referred to as my "long hair" music. I cry at most choral pieces, and Saturday we are going to hear the Faure Requiem. I'll take lots of Kleenex. In high school I played the flute in the band, and I took piano lessons for 12 flipping years. I wish I could say I had talent, but I don't. Just like I read instead of writing, I listen instead of playing. And they say confession is good for the soul, so here goes. Since the last parent died, Julie's mom, four years ago, we have watched Lawrence Welk at seven on Saturday nights. This schlock brings back memories of the hurried Saturday night dinners of childhood so mom and dad could be in front of Lawrence by the overture. When the dancers come out of the audience, we pick this one and that one as someone who could be one of our mothers. We cringe when Lawrence introduces Anacani as his little Mexican senorita. But the dated music brings our parents and grandparents and aunts and uncles back to us. What can I say? Nostalgia wins every time. Besides, no one can play ragtime like Joanne Castle. We also are on Facetime with our friends Tim and Victor,joined by our friend Ian, who keep up a running commentary on the costumes, the performers, and most particularly the hair, as only a trio of gay males can do. Maybe you just have to be there. That sounds like a delightful way to spend Saturday nights!! Sounds wonderful! Were the Lennon Sisters on the Lawrence Welk show? I remember meeting Peggy when I was a kid. Peggy was already a grandmother by that time. She let me sit on her lap :-) . Beautiful person. I saw reruns on tv and they showed the Lennon Sisters as teenagers. I agree, that sounds like a great way to spend a Saturday night. I was a kid when Lawrence Welk went off the air, but my grandma used to watch it and it always reminds me of her. And I LOVE big band music. My husband and I play it when we have parties and it brings just the right atmosphere. The reruns are on PBS every Saturday night here. I’m thinking there must be a huge audience that brings in pledge dollars. Yes, the Lennon Sisters are still on! Same here. I don't much buy into this concept, but when I watch it, I kind of get it when people say it was a "simpler" time. Nothing complicated, just nice, easy-listening music. I grew up listening to the music of the 80's. The Sunday morning American Top 40 countdown was my bible of music in the early part of the decade. Then came my awakening to the glorious nature of hard rock and heavy metal. I don't know if you'd say that listening to that music today transports me back to that time considering I never stopped listening to that music in the ensuing years. Nowadays, I get to write about the acts I grew up listening to. At least the ones that are still out there recording music and playing concerts. Perhaps a certain song might take me back to a certain time and place though. I attended catholic school in the 2nd - 4th grades. In fourth grade, I remember getting in trouble for being the wrong place and the wrong time as some classmates ran down the hallway singing AC/DC's "Big Balls". So whenever I hear that song I think about that particular moment. Believe me, the teachers were NOT impressed. Which music did you like better? AC/DC's Back in Black was one of the first albums I remember. I think I was 12 when it came out. To this day, it's one of my all-time favorites. But I have to admit I prefer Bon Scot's vocals and "BIg Balls" and, of course, "Dirty Deeds Done Dirt Cheap," are, dare I say, anthems, for me. Bibliophile, hard rock and heavy metal is my passion so that's what I like better. But I still like the pop music stuff from the early to mid 80's as well. I tend not to abandon the things I like even if I might expand my interests beyond them at some point. Holly, you can't go wrong with most of AC/DC's stuff. And "Dirty Deeds Done Dirt Cheap" is one of my first anthem memories. Music is that rare constant the everyone finds powerful. While the specifics change, everyone knows what it feels like to be transported by the power of music. I had to laugh Holly, I so remember those days of trying to get the perfect cassette recording off the radio. Back then, it was those little triumphs that really mattered. As you know from my review, I loved Murder-A-Go-Go's. There is something for every reading taste in this collection - not unlike how people enjoy different styles of music. And just as people say "let me listen to this song that everyone is talking about...," I hope readers will take the chance to sample authors that are out of their comfort zone. They will be justly rewarded. Kristopher, like you and Holly I also know about trying to get the song recorded off the radio broadcast. I still have a cassette tape somewhere that has the Casey Kasem announcement of the Guns 'N Roses song "Sweet Child O' Mine" becoming the #1 song in the country. And I have a few other tapes with various songs recorded onto them as well. Kristopher, isn't technology amazing? I remember my father using a cassette tape recorder when I was about two years old. Two songs I remember feeling particularly triumphant about recording are Culture Club's "Karma Chameleon" and Bryan Adam's "Heaven." I still love those songs, maybe because it was so hard to get just the right recording back in the old days! Thank you, again, Kristopher, for your review and support of MURDER-A-GO-GO'S. I get so many great recommendations from your site, it feels marvelous that you like this book. Sounds like no one just bought cassettes. Rick, I bought cassettes! I still have a bunch of those albums I bought on cassette and thanks to having a friend that owns a record shop, I am still buying cassettes these days as well. I turned that into a series of articles called The Cassette Chronicles for Limelight Magazine. Some of the artists I've written about for that series have seen the pieces and enjoyed them enough to reach out and say thanks or share the links on their FB pages. I bought cassettes, but I had to be choosy since my allowance didn't go very far. Gosh, my entire reason for being in the sixties was to make sure I got the top 40 on my tape recorder every week so I could have a way to play them all in a row. (I certainly wish I had those tapes now!) And they were reel to reel, which I edited with a little editing razor and white editing tape. I thought I was a secretly cool. I know every word of every song from the 50s 60s and 70s, and also I’m a huge fan of music from the 40s. But the 80s are when I’m lost… There is a chunk of music that sort of passed me by… Tell me what you think I should listen to: Duran Duran? The Ramones? The Cure? I know you are wincing, but I missed that music era... but I was the vice president of the Midwest chapter of the national Beatles fan club, does that count? Holly, this is so great to read! Love this idea. Duran Duran has a number of great Top 40 hits, but you'd probably be best just picking up a greatest hits collection. The Ramones? Oh man, I can just see you bopping along to "I Wanna Be Sedated". I was never much of a Cure fan though. Still, I'd pay good money to see you headbanging and throwing the metal horns to some of the rock and metal songs I liked then and now. Did your experiences using your tape recorder give you practice before you started your career as a broadcast journalist? Hank: I'm sitting here laughing that you actually edited your top 40 tapes. I love that so much, and honestly, from what I know of you, it doesn't surprise me. Me, I was content to have those messy cassette tapes with the first chorus chopped off of every song. I was a Cure fan, but I'm wondering if someone new to 80s music would like it. The Ramones, definitely. And of course I love Duran Duran. But the Go-Go's Beauty and the Beat can't be beat (see what I did there). It's one of the best pop albums ever, I think. I wonder if my gym has the same 80's loop on its soft rock background music? When I do heavy housework I listen to the Doors long version, "Light My Fire." Gets me revved up every time. I listen to opera CD's while I make dinner and jazz in the car. My scent memory brackets each decade with popular colognes. Margaret, yes, I have scent memories too. The smell of felt pens brings back memories of my early school years at Catholic school. Interesting about soft rock music while doing heavy housework. My old gym used to play classic rock non-stop. I love classic rock from the 70s but I got so sick of it I haven't listened to it much since I quit that gym. Recently my son and I played Name that Tune and it was such fun. Using his phone he would play just the first note or two and I'd have to guess. One I particularly remember was For What It's Worth by Buffalo Springfield. It wasn't a song I was particularly fond of but I couldn't help but recognize it. Another was Africa by Toto which I had totally forgotten about. It was good to have that one back in my brain. I didn't realize that grocery stores deliberately played music from certain eras but it does make sense. I always try to remember who was the artist for the songs I heard. Last week I quickly recognized Hall & Oates Kiss On My List. Was Name that Tune a television show? It was a TV show many many years ago - I can barely remember it. But my son and I played it on the couch - no TV or game board or anything like that! I loved Name That Tune! Someone needs to do a re-boot. It was hosted by Ron Ely, wasn't it? Google says that was Face the Music. NTT was Jim Lange (when I watched it), I think. Oh I remember listening to the "Weekly Top 40," cassette recorder at the ready. I'd get so mad if my mother or younger siblings interrupted me. I still get transported by the 80s. When it started coming up on the "oldies" station I wanted to cry. Which music was on the Top 40? Years ago I heard U2's "With or Without You" on the classic rock station and I was having none of it. Seems like that song came out yesterday! U2 is featured on a lot of classic rock stations, they fit the general programming parameters for those stations. And The Joshua Tree album is one of the single best albums ever recorded. Diana, it would have been the 80s - pop and hair bands were my "thing." One of the best gifts I ever received was a mixtape (Yup - that's my demographic) that a college friend sent to me when I was in Peace Corps. Michelle Shocked's "Anchorage" puts me back in my West Africa home every time I hear it. Hank - I think you were cool if you were editing with razor and editing tape. I used to date one of the DJs from the school radio station and would call him to ask him to replay something if I missed it when I was trying to record it. I can't imagine why the station director wasn't a fan of this strategy. I'm kind of a musical nomad. I love classical music and am developing something of an obsession with Charlie Bird Parker in my jazz explorations. But - as a child of the 70s and 80s, I do find myself singing very loudly to Queen, Talking Heads and Foreigner. J. Geils Band was big where I was from, as much for their music as for the fact that the band members occasionally showed up as substitute teachers in our school before things solidified for them. The J. Geils band was massive with their album Freeze Frame and those perfect songs like "Centerfold" and "Love Stinks". I remember loving every time those came on the radio. Lysa, when you were in the Peace Corps, did you have a portable tape cassette with batteries so you could listen to music? I was not sure if there was electricity where you were in the Peace Corps. Jay, remember the "Centerfold" video? It seems like we're both of MTV's first wave generation so there's a lot of music from that time period that goes hand-in-hand with the video for me. Holly, yes I remember the video. Of course, there was another place I heard the song a lot but given the makeup of the people on this blog, it is a story for another time. Like many that grew up in the 80's, MTV was the be all end all. I remember wanting to see the Billy Squier video for "Rock Me Tonite" whenever it came on (my friend's uncle was the drummer) and the Whitesnake video for "Here I Go Again" with Tawny Kitaen on the car was heaven. Ann, my childhood was also spent watching Lawrence Welk on Saturday nights. We always went to our paternal grandparents' home that evening, and we either watched TV with everyone else, or read the pile of Readers' Digests in the other room. The commentary sounds like a blast to me! Almost all my male gay friends are screamingly funny. As a little kid and before I really developed my own musical tastes, the family would watch Lawrence Welk and Hee Haw like it was appointment TV. A lot of people loved Lawrence Welk music. Did your grandparents like the music too? Oh geez. Hee Haw. Such good memories of watching that show. We were just talking about 80's music yesterday morning. My 48-year old daughter and her family were visiting, and it turns out that 14-year old Zak has an 80's playlist on his iPhone! And it's his favorite. Holly, this is a fun post, thank you. I also like almost all music, from the Big Band/Gershwin type stuff, through the 50's hillbilly and rock n' roll my mother listened to, all the way up to Cardi B and Charlie Pugh. (Not much of a fan of some rap, though.) The best thing that ever happened to me was Sirius XM in my car, with every kind of station, and Pandora for every non-driving situation. Karen: I'm glad you enjoyed my post. I do like some rap/hip-hop music but, of course, some of it is problematic. Times have certainly changed, I'll say that. Thanks to a recent Reds blog I've been spending time with the Dixie Chicks and Linda Ronstadt. Today I'm in the mood for some Santana, Earth Wind and Fire and possibly a dash of Jim Croce. Yes! I am a proud child of the 60's!! I loved the first three Dixie Chicks albums. But their comeback album after the Natalie Maines controversy was hit and miss. They had so much potential to be megastars but after the controversy, country music essentially shunned them. Jay- I appreciate every one of your replies today. I love it when you take us by the hand and lead us through your passions. Your chance to shine! Lyda, I remember the Dixie Chicks. I remember buying a CD after I started hearing again with my cochlear implants. My dad had a Jim Croce album (greatest hits?) that I ended up buying as an adult. As a kid it kind of haunted me that he'd died in a plane crash at such a young age. Carole King! I still have my vinyl copy of TAPESTRY. I alternated between that and Vivaldi all through college. I never was much of an Elvis or Beatles fan. Before that, Buddy Holly and Brenda Lee... Remember It's My Party and I'll Cry if I Want To? Leslie Gore, who had a range of about a single octave. Therefore great for a singalone. Hallie, I remember Carole King from the Gilmore Girls. Rory's BFF Lane loved Carole King's music. And Carole King herself was on the Gilmore Girls show. There are so many albums I wish I still had the vinyl of. Last year I bought a turn-table and I've slowly been re-building my collection, but finding my old faves hasn't been easy and some of them are expensive. I'm still looking for a copy of the Go-Go's Beauty and the Beat (my brother found me a copy of Vacation). I was a teenager in the 60s and early 70s. What a glorious time for music--or does everyone feel that way about their era? My husband is always playing the one-note game with me and I almost always know the song on the first note. I kind of missed the 80s as I was in major mom mode. But that was also my opera and symphony decade. I had season tickets to both. Now I listen to so much different stuff. I'm an ardent fan of the Voice, partly because it introduces me to so much different music. Deborah, did you live in Scotland for a while? I wonder if you heard bagpipe music every morning. And did you like bagpipe music? Isn't it great to have season tickets to the ballet, opera and the symphony? I'd watch The Voice and similar programs if my husband would watch with me. Since it's not his thing and I don't want to spend too much time watching TV I usually don't see them. But as someone who dreamed of being a singer, I find myself drawn to them. Lucy, what is Red Rubber Ball? Was it a musical band? I'm not familiar with Red Rubber Ball, either. Yes! Red Rubber Ball! And from the same time period Feelin' Groovy. Slow down, you move too fast, gotta make the morning last....Used it as my mental bowling song. Bobby Vee? "Like a red rubber ball, I come bouncing back to you..."
The mornin' sun is shinin' like a red rubber ball"
Bouncy light pop sound from a group called The Cyrkle. 1966. Summer break from college, on the radio, driving home after waitress job. Music as a time machine? Ya think? Some years ago, I was listening to Elvis in my grocery store, and the checker seemed to be jamming. I commented on that, and she said that her grandparents listened to him. That stopped me in my tracks as I don't think I had any grandchildren then (must have been more than 10 years ago). And, the playlist at the store has now crept into the 80's. What puzzles me is that the current playlist seems to be covers of the old songs rather than the originals I remembered from the Elvis playlists from years back. Is that the case for many of the new "background" playlists, and what has that done to/for the original artists? My grandmother liked Elvis music. I tend to think of covers more as "elevator music." My grocery store plays originals. But my dad was an Elvis fan—he's a bit younger than Elvis was, I think. But that was his era. Oh, give me the Eagles, and Tull, and Crosby Stills, and Nash, and the Who, and Joni Mitchell, and Janis Joplin, and Donovan, and the Beatles, and... you get the picture, See ya at Woodstock. Janis Joplin and the Beatles for sure. I like the Eagles but never got the hang of CS&N. Kait, do you still like their music or was that another lifetime ago? Holly, this is such a great post - music really is a Tardis of sorts. It's amazing how a song can bring you right back to a place so clearly that you feel everything that you felt at the moment the song played. Plus, I love the Go-Go's! Thank you so much for hosting me, Jenn! And my respect for Jenn just went up even more for the TARDIS reference! I live on the west coast, so it was lovely to wake up to all of your enthusiastic comments. As I like to say, the Go-Go's aren't the obvious choice to inspire a crime fiction anthology, but it turns out, they're the perfect choice! Songs are as powerful as scents when it comes to bringing up memories. I grew up listening to the Lucky Strike Hit Parade on tv. To this day hearing certain songs brings back such nostalgia. And rock and roll. Elvis forever! Mom used to love the song Wunderbar and would sing along. Unfortunately she couldn't carry a tune in a bucket. My dad also loved all kinds of music. Both of them really loved western swing and Texas swing more than the Big Band sound back in the 40s. I still remember Dad singing a Freddy and the Dreamers song while doing the Freddy. I thought I was going to fall over dead from laughing. My freshman year of college in Austin was so enjoyable. And the local radio was great. They played a fabulous mix. In the space of an hour your could hear Paint It Black, Mantovani orchestra, country hit Skip a Rope, Peter,Paul & Mary, Beatles, you name it. All in one place! To this day Glen Campbell singing Galveston brings me to tears: the lyrics, the times, all of it. I'm fuzzy going forward through the 70s and onward. What with working and raising our recalitrant son. Loved Queen, Cyndi Lauper, Tom Jones. Johnny Cash, Willie, Lefty Frizzell, Merle Haggard. Some opera. Bagpipe music. Some hymns. Some Ramones. More stuff than I can possibly remember. Our game is hearing a song and then trying to figure out who's singing. Yea Hank! The ducks are back! What a great post, and the book sounds terrific. Seems like someone or other has touched on it all, but I'll throw mine in anyway. Early on, my parents listened to lots of big band, on 78s. Glen Miller, Tommy James, all the rest. For myself, I got started with "Blue Suede Shoes" (Carl Perkins) was the first 45 I bought. Loved the Crickets, Richie Valens, Tommy & the Juniors ("At the Hop"). I had a box of 45s, over a hundred of them, I dragged to friends houses so we could listen. What a blast. If it was in the top 40 between 1953 and 1960 I had it, loved it. But music changed in the early 60s with the British Invasion, and I loved the Beatles, Stones and many of the others. Also loved the Eagles, really loved their albums. What a thing to go to Licorice Pizza in Anaheim on the day a new album was released. Get home, open it up, put it on the turntable, drop the needle. Wow. I was also getting into jazz at that time, and now jazz and classical is about all I listen to. But songs from the 60s and 70s can sure take me back. Oh, and Holly? For some reason, I always think of the Go-Gos and The Motels together. I had a cassette with Go-Gos on one side and Motels on the other, played it until I wore it out (or it jammed). The Motels' "Only the Lonely" was on repeat at my house back in the day, but I haven't heard it for a long time. I think I'll listen to it now! It always amuses me to think that my initial music interest as a young child started off with The Statler Brothers and here I am worshipping at the altar of Iron Maiden, Savatage, Doro Pesch, Leather Leone and Metal Church these days. Supermaket music where I live (NY) tends to be 60's and 70's, lots of Beatles, Simon and Garfunkle, various fluffy pop. OK with me but I can't figure out why. It's hard to think of music that I don't like. I don't know much about heavy metal or rap. I heard folk music, 40's & 50's from my parents. I started buying records in the 60's but didn't follow everything in the 70's and 80's. I also like Broadway shows and some classical and country music. This reminds me I used to check out records from the library when I was a kid. Barry Manilow and Peter, Paul, & Mary were a couple of my favorites. I must've been around 10 or so. Holly, guess what song came on the radio as I was driving in the car after I got out of work..."Centerfold"! We were driving last weekend and my best friend's son asked, "Beth, what music do you listen to when you are in the car?" He's about ten years younger than I am, a 'younger brother' to me, and when I started to reel them off (the Go Go's, The Police, Bruce Springsteen, Prince), I heard his teenage daughter in the backseat saying, over and over, "Oh, I love them! I love Prince! I love the Go Go's!". I don't know if that makes me the cool aunt now, or if I just weighed in or the teen side of an ongoing music war, but it made me laugh and wonder if my music has become retro-chic.